I discovered cowboy cookies a couple of years ago at the fantastic La Grange General Store / Backyard Bikes in the town of La Grange (which, I think means "the grange"), WI. My Midwest mountain biking friends know La Grange as the heart of the Kettle Moraine State Forest and an excellent trail network. But I digress. So the General Store sold these delicious and enormous cookies. After a fun few hours on the trail one summer day, I headed home with the inspiration to make them myself. Mix flours, soda, salt, baking powder, cinnamon and cocoa together, set aside. Cream shortening (butter) and sugars. Add eggs and vanilla. Beat until fluffy. 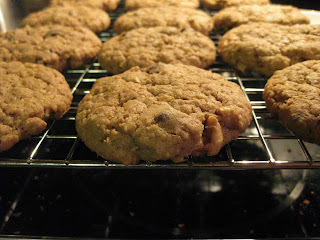 Add flour mixture, then stir in oatmeal, choc chips and nuts. Form into golf ball-sized balls, flatten and place on ungreased cookie sheet. Resist temptation to eat the delicious dough. Bake 12-14 minutes at 350 degrees, ovens may vary so watch time; do not over-bake. Centers should appear soft and puffy while the edges light brown. Eat three or four of 'em - heck a whole sheet of 'em when warm. 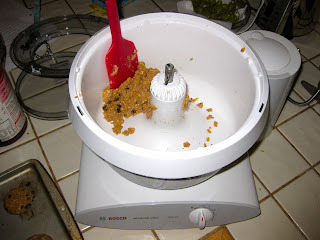 Oh, I should mention that I am fortunate to have a sweet Bosch Universal Kitchen Machine to do the mixing for me. It's especially good for kneading bread dough. Thanks to Canoelover for the recommendation! I should mention that, aside from the fact that they're both round and brownish, mine look nothing like those from the General Store. Man, the house smells great tonight.